This one has a modern, on-trend sound, and a curious history. 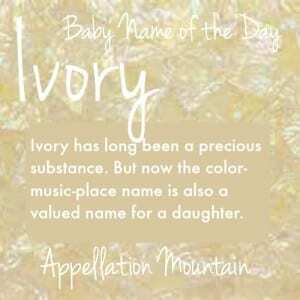 Color Name Week continues with Ivory as our Baby Name of the Day. The Normans invaded England in 1066. They brought their language along, and in the centuries following the conquest, the ruling classes spoke a language sometimes called Anglo-French. Ivorie replaced the Old English word elpehdban – elephant bone. Ivory has been our name for the precious substance ever since. And it is a precious substance, taken from the tusks of elephants, as well as other creatures’ teeth and tusks. Technically, it’s dentine – a calcified tissue not until human teeth. Trade in elephant tusks dates back to the fourteenth century BC, so it’s long been considered desirable. It’s traditionally used to make dice and piano keys, so they’re sometimes called ivories. The word can be used to describe a pale, flawless complexion, and academics are sometimes accused of living in an ivory tower, isolated from practical, real-world matters. But the substance was sometimes used for practical things, too, like storage boxes, as well as those that fall somewhere in between, like billiard balls. In 1982, Stevie Wonder and Paul McCartney scored a hit with “Ebony and Ivory.” At its simplest, the phrase refers to the keys on a piano. 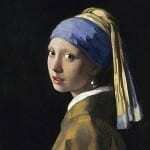 But it’s been used as a phrase to describe racial harmony since the early twentieth century. Today, it’s associated with a brand of soap, too, first sold in 1879. Here’s a surprise: from the nineteenth century into the 1970s, Ivory was on the fringes of the boys’ Top 1000. Comedian Keenen Ivory Wayans comes to mind, and there was a minor male character on 1990s comedy Northern Exposure, too. Then Ivory fell out of use. 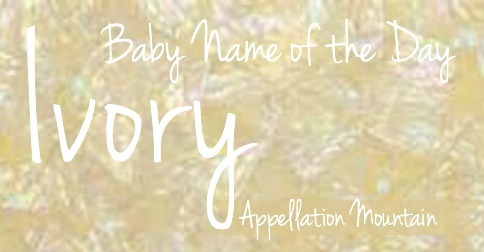 Since the name was never very common, it didn’t take long for us to all-but forget that Ivory had even been used as a child’s name at all. Ebony – the yin to Ivory’s yang – was used almost exclusively for girls, beginning in the 1960s and peaking in the 1980s. 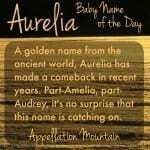 I associate it with African American parents seeking heritage choices, and, of course, Ebony sounds a lot like all of those three-syllable, ends-in-y or -ie names that we’ve long embraced for girls, from Dorothy to Emily. Of course, so does Ivory. Since the 1980s, the numbers gave this one to the girls – but it was still unusual. There’s no single reason why Ivory started to rise around 2010. My best guess? Take Ivy, Emily, and Avery, and it feels like a logical name choice. Ivory re-entered the US Top 1000 in 2013 at #866, and climbed to #753 in 2014. Some parents note that ivory is associated with the decimation of the elephant population, and feel that makes this name negative. Color names are quite stylish today. 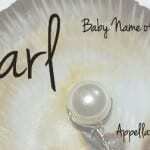 It could be considered a musical name, another popular category. I’ve tripped over Ivory in a handful of places – most recently this Kate Morton novel. Perhaps there are others! Africa’s Ivory Coast makes this a place name. 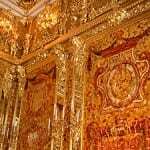 And, of course, Ivory fits with Ruby and Jade – names associated with jewelry and precious objects. 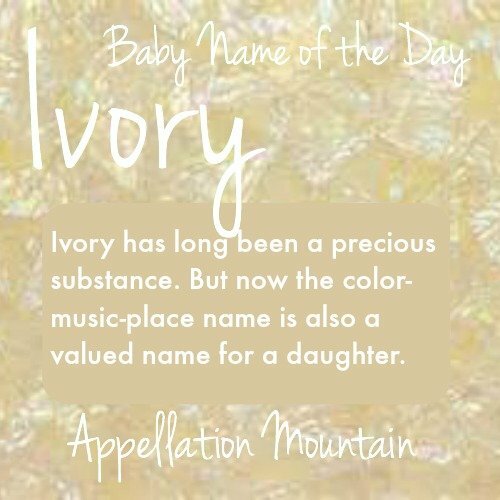 Overall, Ivory seems like the kind of name that will catch on – if only because it so perfectly with so many current trends, as well as traditional ideas about what makes a great name for a girl. Would you consider Ivory for a daughter? Have you met any girls by the name? I also came across this name in the Kate Morton novel. I feel like it’s perfectly on trend right now. As Abby said, a perfect blend of current favorites like Ivy and Emory. As an Ebony, I’ve had to deal with Ebony and Ivory jokes (including one teacher who every time he said my name off the role he would ask where Ivory was). I can imagine with Ivory it would be even worse since it’s a rarer name. I don’t mind it (I prefer the spelling Ivorie though) and it could work as a long form for Ivy. It seems as that when Ivory first started to fall Ebony picked up and now the two have swapped over with Ivory being the more popular choice. Could you do Vivian please?! I just landed on this name and I really like it! It’s a beautiful word, but I unfortunately can’t get past the dead elephants.